Can Soda Delivery. Many of the selections have multiple options. FREE COMMERCIAL DELIVERY in Metro Atlanta Georgia. 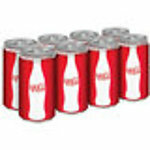 Don't forget our selection of Diet Sodas - Click Here. We strive to offer the largest variety of soda, juice and water available for next day business delivery in the Metro Atlanta area. Need Coke delivered to your office or workplace, we can help. Sold in fridge packs (12 count), for ease of storage and distribution in your office.